After a really huge demand I decided to give away my YEARMIX 2010 as a 2 CD gift. This means you’ll not only get the cd-cover, you’ll also get two mp3 files + cues of my favorite 85 tunes of this year! I wish you all merry christmas and a happy new year 2011! 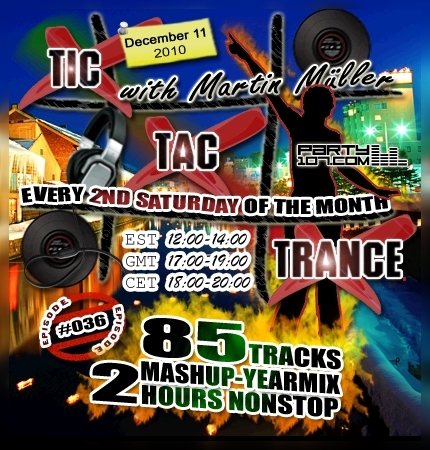 Tic Tac Trance #036 Replay available! 85 Tunes, over 500 Edits, over 20 hours of work, this year’s final episode #036 of Tic Tac Trance will air on December 11 @ Party107.com! Together with you I’ll celebrate my favorite techy, uplifting and progressive trance tunes of this year in a 2 hours nonstop mix. You can expect a crazy mashup festival with my highlights of this year’s trance selection. Make sure to tune in!